At the end of a week where DC solicited a month’s worth of comics without any creative teams attached, Marvel arrived at the Chicago Comic & Entertainment Expo with a load of announcements setting up the second half of its year. The big one involved the death of a certain furry, clawed Canadian in The Death Of Wolverine weekly series by writer Charles Soule and artist Steve McNiven, slated to debut in September. That segues into “A World Without Wolverine,” an event that will feature new work by artist Salvador Larroca and writers Kyle Higgins and James Tynion IV, two creators who have primarily worked at DC in recent years. X-Man Storm will be gaining a higher profile as she becomes the new Headmistress of Wolverine’s school, and with her new status comes her very first ongoing series by writer Greg Pak and artist Victor Ibañez in July. Peter “Star-Lord” Quill is another character getting a big break in this summer’s Guardians Of The Galaxy film, and Marvel is launching a new The Legendary Star-Lord ongoing series by writer Sam Humphries and artist Paco Medina in July to coincide with the movie’s release. 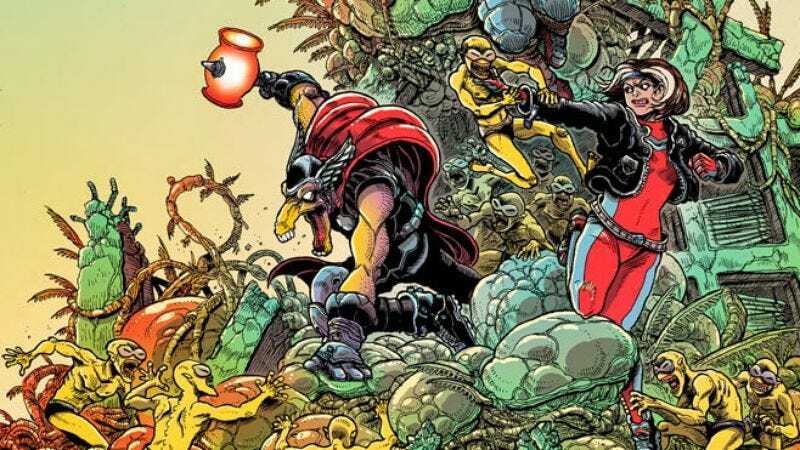 Marvel’s summer crossover Original Sin is about to kick into high gear, and the publisher addressed the ways its heroes would be affected by the event. Thor and Loki will discover that Neil Gaiman/Todd McFarlane creation Angela is their long-lost sister; Spider-Man will learn that another person was bitten by the radioactive spider that gave him his powers (a woman who goes by the name of Silk); and Mark Waid will spend some time exploring the character of Matt Murdock’s nun mother Sister Maggie in Daredevil’s two-issue tie-in. And because it’s not a proper convention without a tease for a new crossover, Marvel also revealed there will be an event at the end of the year called Axis that will bring the Avengers and X-Men together. To celebrate its 100th anniversary, Marvel will also be releasing five one-shots in July imagining what the Marvel Universe might look like in 2061, 100 years after the debut of Fantastic Four. These include The Avengers, written and illustrated by James Stokoe; Fantastic Four, written by Jen Van Meter and illustrated by Joanna Estep; Guardians Of The Galaxy, written by Andy Lanning and Ron Marz and illustrated by Gustavo Duarte; Spider-Man, written by Sean Ryan and illustrated by In-Hyuk Lee; and X-Men, written by Robin Furth and illustrated by Jason Masters. On top of all this, Marvel also announced a few new miniseries. September sees the release of The Dark Tower: The Drawing Of The Three - The Prisoner by writers Peter David and Robin Furth and artist Piotr Kowalski; as well as George A. Romero’s Empire Of The Dead: Act Two, by writer George A. Romero and artist Dalibor Talajic. And in July, Deadpool Vs. X-Force will be out from writer Duane Swiercynski and artist Pepe Larraz. The convention was relatively light on news from other publishers, although Dark Horse Comics announced a new volume of its Eisner Award-winning anthology Dark Horse Presents for August, with a $4.99 price point and an exciting line-up of stories—including the return of Big Guy And Rusty The Boy Robot by writer Frank Miller and artist Geof Darrow, as well as new installments of David Mack’s hugely ambitious Kabuki. Dark Horse also announced Ghost Fleet, a new 12-issue series about big rigs and conspiracies by writer Donny Cates, of last year’s exceptional Buzzkill miniseries, and artist Daniel Warren Johnson, the rising star creator of the webcomic Space-Mullet. And over at DC? Darwyn Cooke’s drawing the August issue of All-Star Western. So, that’s something, right?